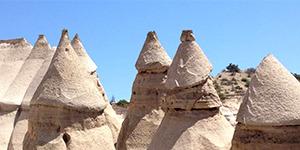 On this trip, you will tour some of the most spectacular rocks exposed in New Mexico. These rocks tell a geologic story spanning nearly 2 billion years of Earth's 4.5 billion year history, and give clues to how and when the oceans and mountains formed. These rocks also preserve fossils that tell us about past life on Earth and how it evolved through time. Our excursion will include several stops to look at different types of rocks as we leave Albuquerque, an overnight camping trip, and several more stops as we make our way back to Albuquerque the next day. These stops will be organized to, first, explore some of the oldest rocks exposed in New Mexico, and, then, we will make our way to some of the youngest. At each stop, we will investigate what each of these rocks can tell us about the history of the Earth. This event is free for UNM undergraduates. Prior geology or camping experience is not necessary. This event is especially great for first- and second-year students who are interested in exploring different STEM disciplines or learning more about research. Large camping items (example: tents) will be provided. Students should be prepared to hike about 2 miles each day.